Enjoy panoramic views of Glashedy Island and the Atlantic Ocean. 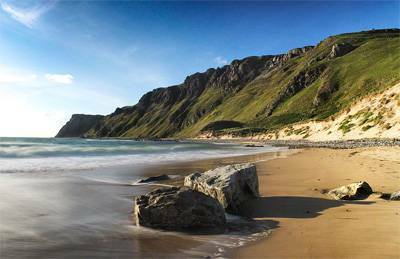 Inishowen has it all – from wild, romantic coastlines to beautiful woodland and rivers; from stunning award-winning beaches to fabulous food; from quality accommodation to a fantastic range of activities and attractions. See a different North West Coast in Winter – still beautiful, but a wilder beauty than that of summer. Wrap up warm and feel the bracing sea air or watch the waves crashing on the beaches. The gem waiting to be discovered in this beautiful area is Ballyliffin! Ballyliffin and the surrounding area offer a superb choice of accommodation which include family-run businesses and four-star accommodation. They all offer an intimate dining experience using locally produced produce whenever possible. Rooms are finished to the highest standards and visitors can unwind in a relaxed and comfortable environment or plan ahead for their leisure activities. 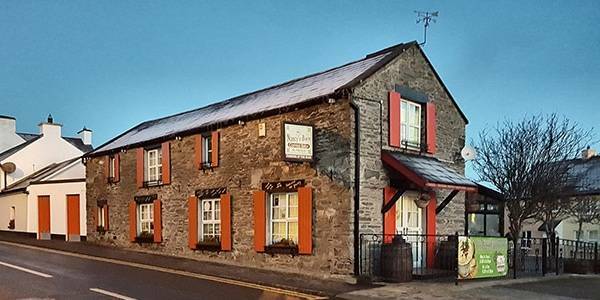 The hotels also have unrivalled views of the Atlantic Ocean, Glashedy Island, the Golf Course, and the beautiful unspoiled landscape of the Inishowen Peninsula. In Ballyliffin restaurants serve only the freshest products sourced whenever possible from the local area so that visitors can enjoy the authentic taste of Inishowen from the hands of world renowned chefs. With a sprinkling of an Inishowen welcome, why not enjoy the taste and hospitality of the Peninsula on your visit. Nancy’s Barn, is an authentic 19th century converted barn and a quirky and innovative restaurant/bistro. They boast delicious home baking and a selection of fresh daily specials. Their speciality has certainly become their world award-winning seafood chowder. Choose from sumptuous A la Carte and Table d’hôte menus carefully selected to bring you the very best of local fresh produce. A superb Bar Food Menu is also available daily in the Rachtan Bar with a wide selection of the finest local fresh seafood, meats and seasonal produce. 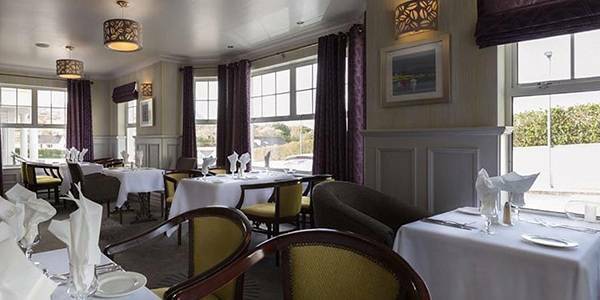 Dining at the Ballyliffin Lodge & Spa Hotel offers exceptional value for money accompanied with great food and quality service. Their award winning chefs, who received an AA Rosette along with a Michelin Guide Listing in 2019, make dining a memorable experience. 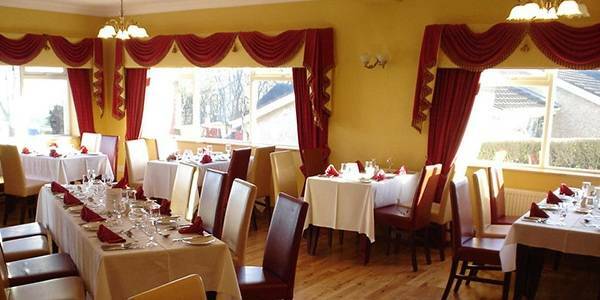 This popular Ballyliffin restaurant offers a wonderful selection of fresh Donegal produce cooked in creative styles to make up their traditional Table d’Hote menu. They also offer Bar Food which is available daily in their Strand Bar, offering great choice and value. 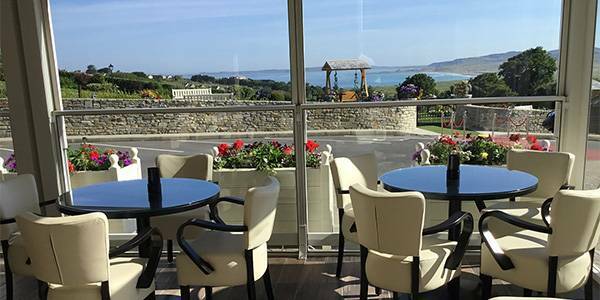 The Linx Restaurant at Ballyliffin Golf Club boasts breathtaking panoramic views of the golf complex and the Atlantic ocean. 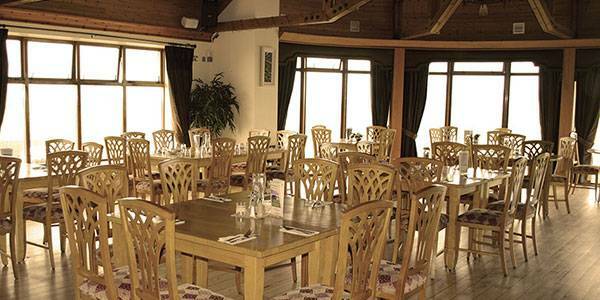 Enjoy dining while overlooking both courses and watching the spectacular sunsets over Pollan Bay in one of the finest restaurants in the North West. 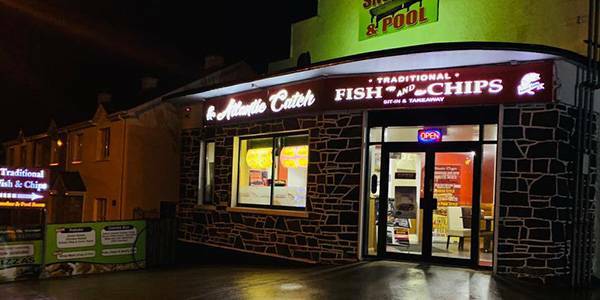 Atlantic Catch is a traditional Fish & Chip shop in the heart of Ballyliffin. 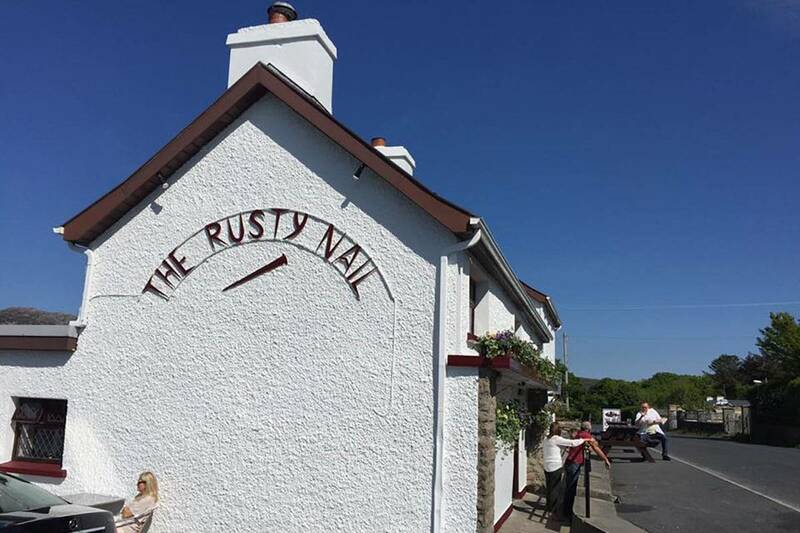 Their extensive menu, that includes delicious fresh home made chips and a range of gluten free options, offers great value and something to suit everyone. All available to eat in or take away. You’ll be surprised how much there is to do..something for all ages and interests..
View our live webcam for surfing conditions at Pollan Bay (not currently active but will be back up and running soon). Ballyliffin Golf Club takes its place among the world’s great golf courses and is ranked among the top 100 golf courses in the UK and Ireland, thanks to the unique quality of the links terrain, set amid natural dunes on the edge of the Atlantic ocean. It happens to be Ireland’s most northerly golf course and players can enjoy long hours of daylight especially in the summer months thanks to the location. Both the Old Links, designed by Nick Faldo, and Glashedy, staked out by Pat Ruddy and Tom Craddock, provide a golfing experience that is both enjoyable and challenging for players at all levels. Ballyliffin Golf Club is the home to The 2018 Dubai Duty Free Irish Open. Thanks to the boom in cold water surfing, recent years have seen an increase in surfers, body-boarders and canoe surfers at Pollan Beach. Facing the Atlantic head on, there are big waves most of the year. However, the same Atlantic-facing aspect also means that the strand is subject to prevailing onshore north-west winds for most of the year. Therefore, wave quality is good at Ballyliffin but sheltered spots are available in south Donegal and on the Causeway coast. 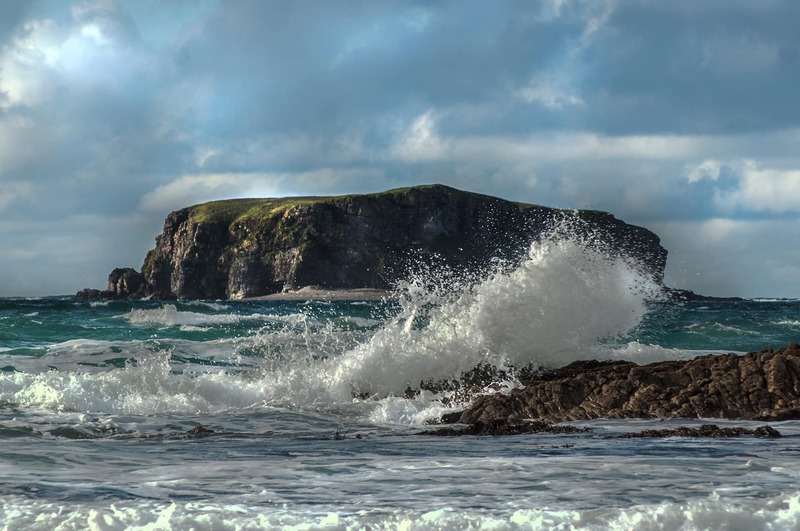 Despite the number of water users, Ballyliffin is best suited for advanced surfers and is not recommended for beginners, because it holds several rip systems which are regionally renowned but are much understood. At the south end of the carpark, one rip system makes its way along the coast while beyond the reefs, 200 yards further up the main strand, another massive rip current demands the skills of advanced users only. In the heart of winter, Ballyliffin holds some of the most photogenic sights a surfer could wish for as tumultuous waves crash in, some the size of houses. Many sightings of porpoise, basking shark and occasional sun fish and orca have been reported from Pollan Bay over the years, adding to the excitement of the world of surfing. The eco-friendly children's area at Pollan Beach is ideal for children under 12 - complete with wooden climbing walls, play-houses and swings. A beautiful walk way has been created over the past number years to allow people to enjoy a scenic walk through the dunes at Pollan Beach. The walkway offers easy walking for all ages with unbeatable views of the Atlantic Ocean, the golf courses and Pollan Beach. Strongly recommended for all visitors to the area and perfect for a morning jog. The Inishowen 100 Scenic Drive is a 100 mile (160 km) signposted scenic driving route around the stunning Inishowen Peninsula. The route passes most of the top tourist attractions and places of interest on the peninsula and there are great things to do at every turn from hiking to cycling, golf to fishing and from blue flag beaches to whale watching and basking shark trips. Tullagh Bay Equestrian Center caters for all the family, from beginners to experts, with both indoor and outdoor arenas. 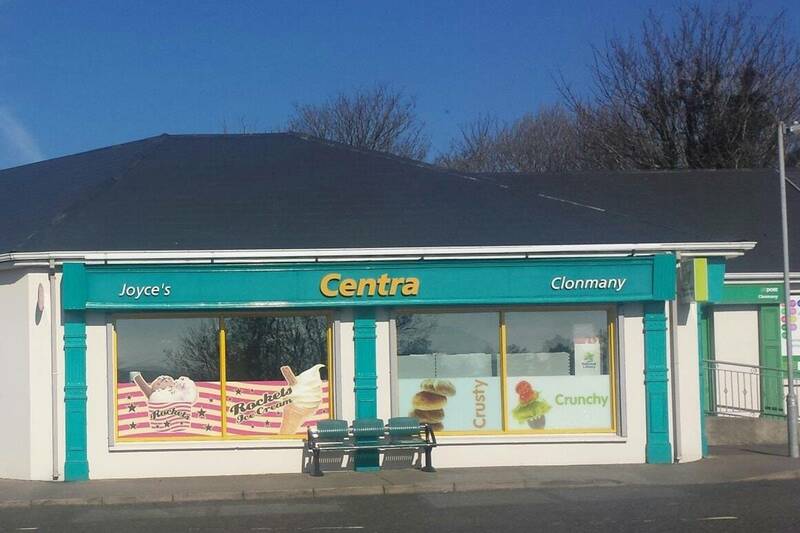 The equestrian centre is located in Clonmany - about 5 minutes from Ballyliffin. Outside of the centre, the location itself offers a great scenic setting for horse riding. Situated near Tullagh Beach and the rolling Urris Hills they offer some great treks and ride outs. They offer the very best in training and facilities to make the most of your time in the saddle. Ballyliffin is well positioned to become a walker's paradise for locals and visitors alike and this is reflected in the huge number of people taking to the highways and beaches of the country in recent years. Start: On R238 at visitors' information sign in village opposite Londis supermarket. Length: 2.7 km (1.7 miles). A bracing route over level terrain except for centre section which involves a gracious climb of 1km. Attractions: Spectacular sea views over Glashedy and Carrickabraghy Castle, passing the deserted village of Mullagh, hidden from view. Excellent views of Crockaughrim to right, Bulbin ahead and Rachtin to the left. The walk begins with a descent towards the shore for about 1 km. 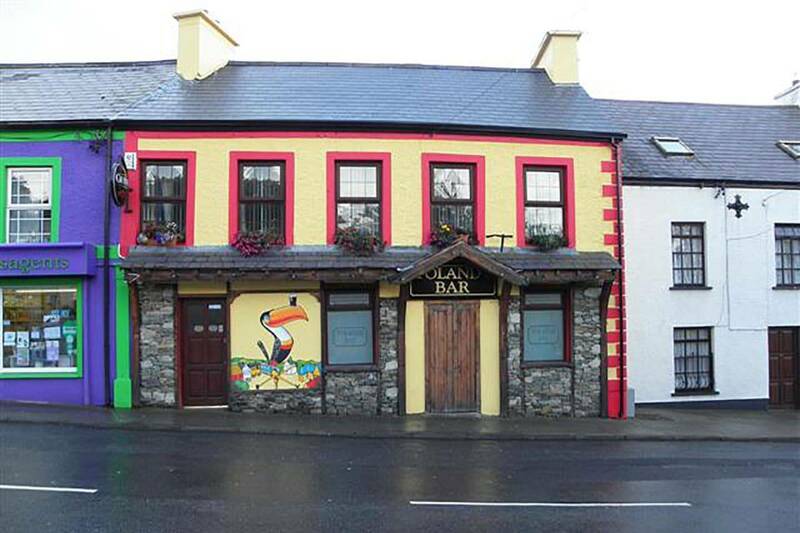 At the Pollan Beach hotel, turn left and begin the climb through Ardagh - birthplace of a famous writer, John Toland. At the top of the hill, beside the helipad, stop and admire the coastal views. The legendary village of Mullagh, now deserted, is hidden from view in trees behind the helipad. Behind it there is a mass rock, a stone row and lazy-beds, used for the cultivation of potatoes in the past. At the T-junction, turn left at the traditional cottage thatched with Inishowen flax. Pass the old green pump as the R238 crossroads looms ahead. Take note of the restored yellow railway cottage on the corner. Turn left and head back to village but before you reach the AppleGreen station, check out the humpbacked, railway bridge, built around 1900, 50 metres down a side road to the left. Start: At the visitors' information sign opposite Londis and bear right towards Carndonagh on the R238. Length: 15 km (9.5 miles). This is the longest walk in the series and will take close to four hours. Ideal for the highly experienced walker, on mostly flat terrain without any hill climbs. Generally tarred road but moves on to rough gravel path on private lands, winding up on sandy coastal walk which is undergoing development. Attractions: The walk has a great variety of vistas - busy farmsteads, lots of beautifully maintained thatched cottages, historic landmarks, good views over Five Fingers Strand with impressive sand dunes, said to be among the highest in Europe. An excellent opportunity to witness the turbulence of the Atlantic and its waters teeming into and exiting from Trawbrega Bay at high and low tide. The return journey offers a unique walk through ever-changing sand dune landscape and hillocks of pebbles on a specially constructed pathway which is very gentle on tired limbs. About 2km from the village after passing through Tornabratley, follow signs left for Famine Village and as you cross the raised beach into the Isle of Doagh, note that these water meadows were once covered by the sea, which cut off the Isle from the rest of the peninsula. Have a look at the roadside profusion of reeds once used for thatching. Watch out for attractive thatched cottages and barns on the way. Having reached the half-way point, why not make a visit to the Famine Village if only to enjoy a warm cup of tea which is part of the tour. A handful of kilometres later, with fine views across Five Fingers Strand, Carrickabraghy Castle appears to leap from the water on the right, famed as a battle place as far back as the tenth century. Jutting out to sea on the other side of the Bay, to the right, is the promontory fort of Dunargus, used to defend the entrance to Trawbrega against Viking invaders. In winter, the waterworks below the castle are quite spectacular with huge jets of white spray spouting into the air. At the castle, the terrain changes and there is a gravelly pathway leading on to the coastal walk, bordering the golf course, through the dunes and back to the village. The mountain of pebbles washed ashore is unique and is now protected so it may be worth while to stop and take a closer look at the variety of colours and shapes. In the past, farmers used them for drains and making farm roads. Length: 10km (6.3 miles). Good level of fitness required. OS Map 3 Discovery Series recommended. No suitable rest points on this demanding 3 hour walk which is ideal for experienced walkers. Road surface very suitable for walking. Attractions: A landscape of contrasts - makes a circle of Crockaughrim with dramatic views of hills of Inishowen, open heathery boglands, scintillating sea views, superb uncluttered scenery, newly planted fir plantations, a diversity of hedgerows and a historic landscape. Loop walk with little traffic. Heading towards Clonmany, the route travels past the Ballyliffin and Townhouse hotels with views of Bulbin ahead, topped with a huge cross, erected for the Eucharistic Congess of 1932. 1km from the village, take sharp turn left at crossroads soon after passing the AppleGreen station. Note a trio of unique two-storey barns on right. Here begins the most difficult part of the walk, through Cloontagh on to Coolcross, involving an uphill climb over 1.5km leading through an open, heathery, marshy landscape which is unfenced. Lough Doo windfarm comes into view beyond the evergreen fir plantation on right. 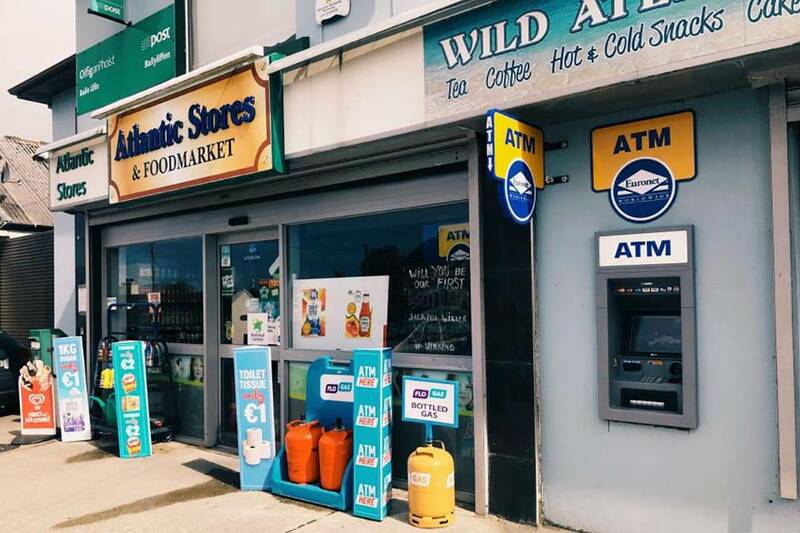 At 3.5 km from the start, (Hill View Fuels sign) take sharp turn left at T-junction and follow route for about 2km over a narrow, uneven, winding road which offers panoramic views out to Slieve Snacht, the highest mountain in the peninsula. The next T-junction marks the half-way point so turn left and foot weary plodders will be delighted to hear that the rest of the journey is all downhill. Suddenly, a totally different landscape of estuary, water meadows and beaches offers a kind of reward to warm the heart for the second stage : Glashedy Island, Trawbrega Bay, Five Fingers Strand and the archaeologically rich Isle of Doagh with its famed Famine Village. This section is well sheltered from the west winds, with high heather-clad ditches rich in furze, fuschia, briar, and hazel. Excellent surface for walkers. A couple of hundred metres later, turn left again for a better view of Glashedy Island. Bear right at the next T-junction in Rasheeny townland, avoiding the untarred road ahead. Look to the distant right for views of Malin and Culdaff. A couple of hundred yards to the right is a hill called Cnocnagalcossagh, named after a bright-footed female Druid who terrified men in these parts long ago. About 0.5 km later, at walled residence, Trawbrega, turn sharp left, passing gates with Ard na Mara written on them, followed by Railway Cottage at the bend. At this point, listen for the sound of the ghostly Swilly Train that rattled on its way to Buncrana as you cross over the route of the dismantled track. As a YIELD sign looms, take care as you emerge on the R238 highway again, and turn left at the sign for Ballyliffin world famous links golf course with its unique dune system. Follow the main road through Tornabratley for 1.5km to get back to the starting point. Start: On R238 at visitors' information sign in village opposite Londis supermarket. and head towards the beach, car park and playground. Length: 9.5km including the return journey (6 miles). It will take a couple of hours to complete the return journey. Attractions: Beautiful sandy coastal path carved out of the dunes, with the golf course on one side and the magnificent beach on the other. The coastal path is a traffic-free zone so only the crashing waves will disturb the pensive walker. Pause to examine the spectacular mounds of beach pebbles stacked between the path and the water. Take a gentle stroll from the village towards the shore and there is a choice of beach walk or dune walk, depending on the tides. 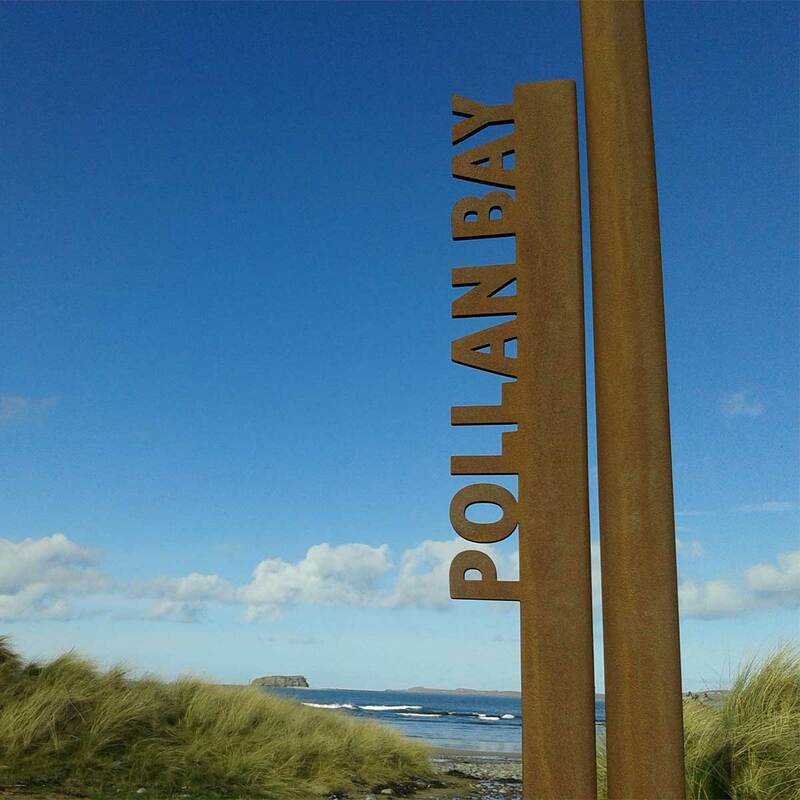 The coast walk is really Ballyliffin's answer to the traditional seaside promenade found in large tourist resorts. The path is undergoing improvements but all age groups will enjoy the spring of the sandy terrain. Start: At the car park close to Glen House restaurant outside Clonmany village and not far from the unroofed Protestant church at Straid. Length: About 2km return; a one hours walk. Attractions: Few walks have such a delicious surprise at the end of the journey. The waterfall at Glenevin is one of the great natural attractions of the area and should not be missed. Suitable for children and all age groups. The peace and seclusion of the area create a heavenly atmosphere. For many years the waterfall was inaccessible until the local community came to the rescue and laid down a pathway through the wild landscape. The richness of the natural landscape has to be seen to be believed and the waterfall is truly one of the beauties of nature. There is space for cars or even a picnic just before the walk or the option of enjoying the hospitality of Glen House which has an excellent menu for the hungry traveller. The mixture of light and shade create a wonderland of nature for the discerning visitor. 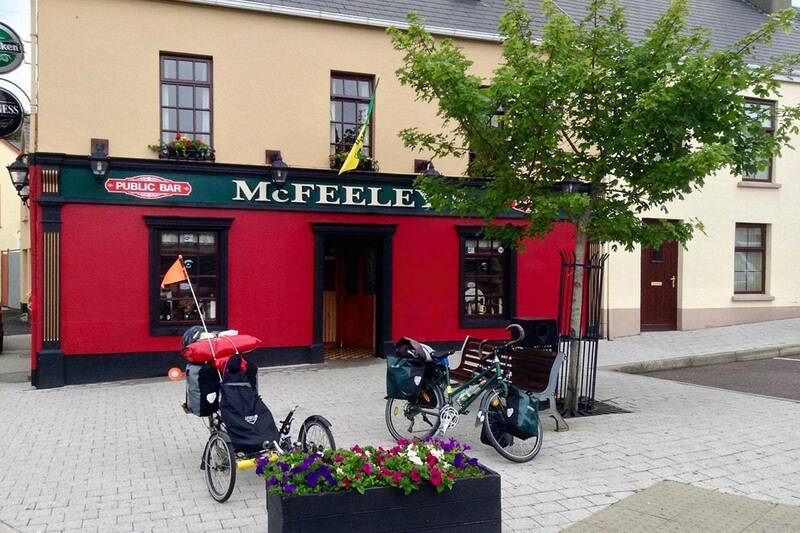 Cycling is a great way to explore Inishowen and see things at your own pace. This region has ample rivers and lakes for the fresh-water angler after a salmon or trout to beach-casting for flounder, dabs, plaice and the occasional sole, bass and sea trout, and in Autumn dogfish and spurdog. There are also 12 piers and innumerable locations for rock fishing. The Inishowen peninsula is surrounded by many wrecks, including one near Portaleen and one between Culdaff Head and Glengad Head. There are also 18 near Inishtrahull Island including one from 1918 - a World War 1 German sub. U.B. 109 and a Greek cargo-ship - the Argo Delos, which in 1960 was heading for Cuba. There are 9 wrecks near Inishowen Head, and in Kinnagoe Bay there is the famous La Trinidad Valencera of the Spanish Armada, which foundered in 1588. In Lough Swilly there lies The Laurentic, which was carrying a fortune in gold to repay British War Debts. Near Malin Head there are over 30 wrecks quite near the coastline due to both World Wars and a treacherous coastline. Trawbreaga Bay is a Wildlife Conservation Area, so wildlife may be seen all the year round. Both sides of the bay can be reached easily by car to facilitate bird-watching. 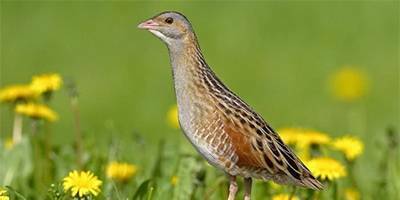 The Isle of Doagh is one of the best places to view the wildlife. (Trá – strand, bréaga – lies) Eider duck flock to Pollan Bay at Ballyliffin at the end of summer. Oystercatchers and plover nest in rock along the shore. The shingle beach is a popular haunt for Tern which flock here in large numbers. The Common Tern and Little Tern are regular visitors and grew in numbers in the 1970s after being displaced from Magilligan in Co. Derry. Along Trawbreaga Bay, between October and March, large numbers of Widgeon, Teal, Brent Geese, Shoveler and Mallard can be seen. The wildfowl thrive on the mudflats of the Bay and can be viewed from the road along the Bay. The meadows of the Isle of Doagh have large numbers of Golden Plover in winter. Barnacle Geese also feed on the meadows along the Bay. Iceland Gulls and Kingfisher frequent the area around Drumaville Bridge. Whooper Swans and Brent Geese frequent the marshes and reeds around Malin Bridge and can be viewed from the bridge and carpark. There is a wide variety of arts and crafts in the local area . Artistry includes bogwood sculpture and woodcrafts, pottery, knitwear and fabric designs, accessories and jewellery. The visitor will be truly appreciative of the wide range and quality on offer, incorporating ancient and innovative design. The stunning scenery and bright natural light of the peninsula has attracted artists for generations - Maurice Wilks, Derek Hill, Norah McGuinness, renowned English print-maker, Norman Ackroyd and celebrated Dutch photographer Jan Voster. In Ballyliffin, the artistic tradition continues and visitors can drop into a beautiful gallery in the village which has works at very competitive prices. Within a short drive of the village, artists welcome visitors to their studios at Carndonagh, Malin, Culdaff, Carrowmena, Buncrana. Anyone interested in photography will be spoilt for choice with all the beautiful landscapes and scenery in the area. We are also one of the few places in Ireland where the Aurora Borealis can be seen at times because Ballyliffin is so close to Ireland's most northerly point, and there is almost no darkness during June/July. With plenty of local attractions and places of interest, here are some of the main places of interest in the Ballyliffin area. There’s always plenty to keep you entertained in the local area – music events, festivals and much more, whether for a good night out in the pub, or day out for all the family! 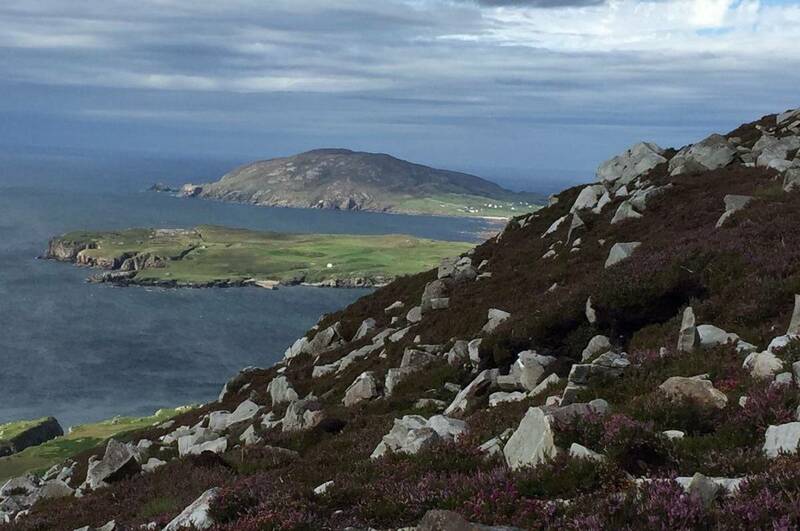 Experience one of the most beautiful routes imaginable – this event is held each Easter against the backdrop of the Isle of Doagh, Lagg, Malin and Glashedy Island finishing up on the scenic Pollan Beach. The Disappear Here Film Festival takes place in Ballyliffin each September. From short animated films for kids, to scary midnight movies for the young at heart – enjoy an utterly unmissable and unforgettable weekend. This is Irelands longest running and best known family festival and is situated in the beautiful village of Clonmany each August. The festival has something to offer everyone and is an event which you will find yourself returning to again and again. 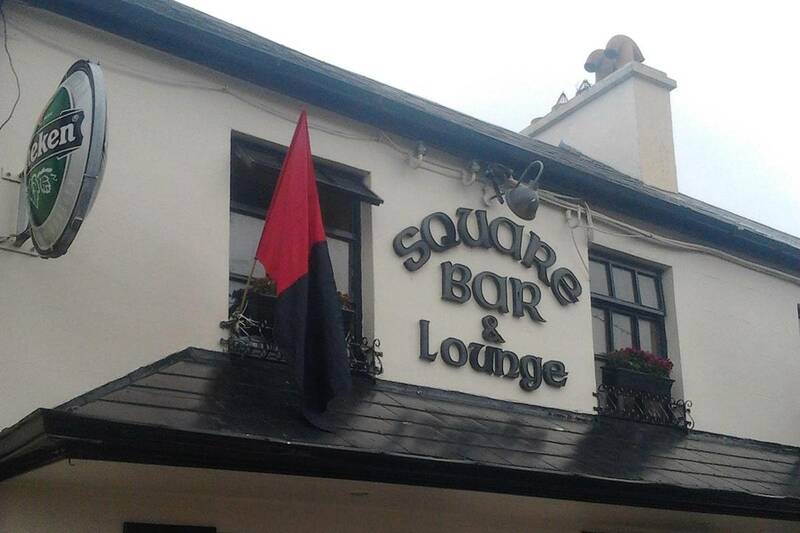 The weekend aims to honor the memory of Seamus Grant – who was a notable local musician, by celebrating the local music, tradition and culture of Clonmany. Takes place in venues around Clonmany and Ballyliffin each October. This four day festival of traditional singing featuring performances, sessions, workshops and lectures takes place each March in the villages of Ballyliffin, Dumfries and Clonmany. Each August the show attracts thousands of visitors from across Ireland and the UK from farmers to young families. It showcases local produce, arts & crafts, fashion, kids entertainment, horse jumping and dancing competitions. 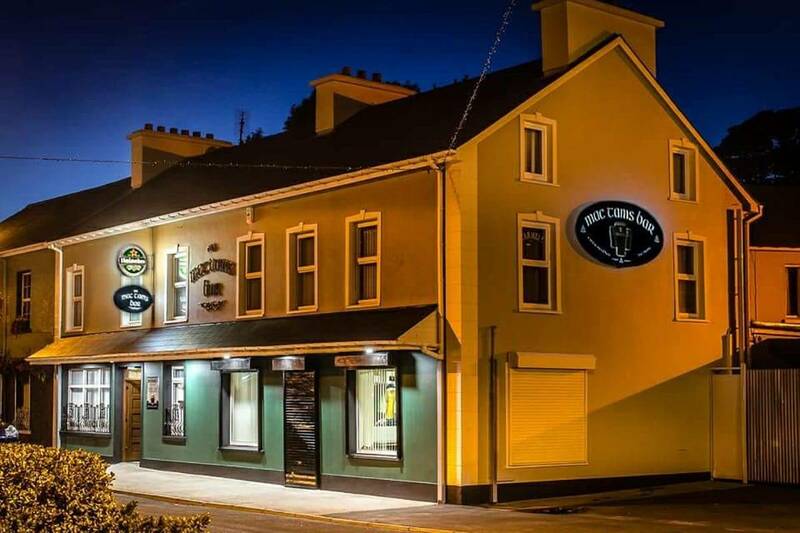 You’ll find anything you need in our local shops, or if it’s a night you’re after out you’ll receive a warm, friendly welcome in any of the local bars! Please support Ballyliffin Development Fund. It is a Registered Charity committed to the promotion and restoration of Ballyliffin as a tourist destination and its heritage. If you have any enquiries for us, please complete the form below and we’ll get back to you as soon as possible. Ballyliffin is 27 miles (44km) from Derry, 37 miles (60km) from Letterkenny, 97 miles (157 km) from Belfast and 171 miles (276km) from Dublin. When travelling from Derry (and Belfast) – cross the Foyle bridge and take the A2 towards Moville, turning off for Carndonagh at Quigleys point (Carrowkeel). Ballyliffin is six miles (10km) beyond Carndonagh.